Sudan, Map of Oil Producing Regions. 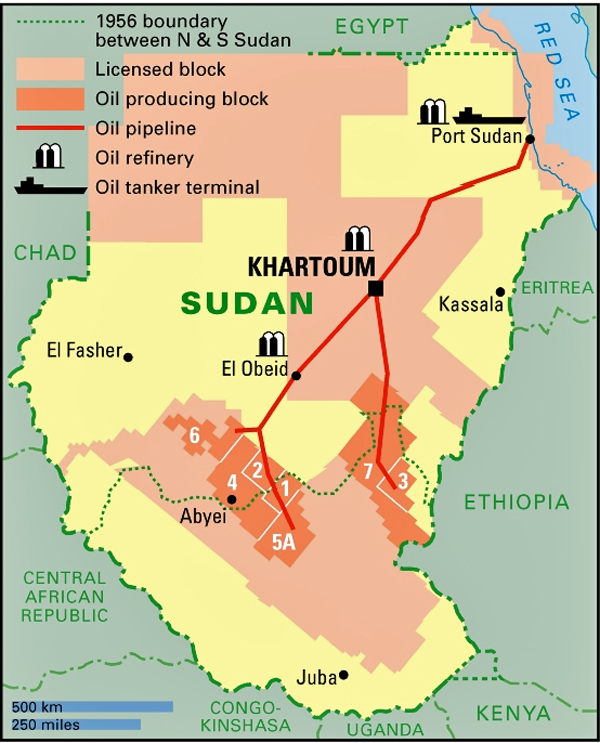 The Sudan has oil for sale; it sells oil primarily to Asian countries, among them China. What if, instead, the sales went to Europe? Or to the U.S.? In Olen Steinhauer’s espionage tale The Tourist (book 1 of the Milo Series) a mysterious free-agent called The Tiger has traveled to Khartoum to assassinate a Sudanese official. The Tiger has also carried out several other seemingly unrelated assassinations that may be aimed at interrupting Sudan/China relations. The CIA is ordered to put Tiger out of action and get to the bottom of this plot. Undercover field agent Milo Weaver is assigned this dangerous and difficult task. It may mean the end of his career. “Riverun, past Eve,” Tom Granger said. Learned Grainger had created go-codes out of the first lines of novels. His own Joycean code told him he was needed someplace new. That is a mouthful for an agent to remember when an assassin is shooting at you. Milo, whose cover name is Charles Alexander, works for an ultra-secret group within the CIA that is called the Travel Agency. Using that same travel metaphor, Milo is a Tourist. He travels the world disguised as a tourist, but, unlike the usual tourist and like his British cousin James Bond, Milo is licensed to kill. As the flashback continues: Milo’s new assignment takes him to Slovenia to trace down some missing money. Unfortunately, the job turns out badly; Milo is shot and it seems that his days as a Tourist are over. The story picks up years later, Milo is working at a desk in the Travel Agency. It’s July 19, 2007 and a report comes across Milo’s desk at the Travel Agency that the notorious Tiger is traveling in the US under the name of Ross. Milo decides to track this down himself. (He can’t resist going back into the field.) Two weeks later, police arrest Roth in Tennessee and Milo races to the site. Under interrogation, Ross/Tiger reveals that who he works for. Milo is stunned. The author adds one more element to complete the novel’s lengthy set-up: Ross, alias the Tiger, dies mysteriously while in custody and Milo is blamed. Homeland Security agent Angela Yates goes to arrest Milo, but he is warned and goes undercover. His flight convinces Yates that he is guilty. She will do all she can to bring him in, and she is a formidable investigative agent. Milo maintains his innocence, but he convinces no one, not even his wife Tina. He will have to uncover the truth to clear his name and the truth must lie within the Travel Agency. Can Milo crack the Travel Agency and clear his name? Help will come from unexpected corners, but the author keeps the reader guessing until the end of the story. This is a provocative novel with convincing characterizations of Milo, his wife Tina, Milo’s boss Tom and several of the Tourists that Milo works with. The author Steinhauer also gives us a full development of Homeland Security agent Yates. Surely some of these characters will continue into the next novel in the series. The Tourist a presents the reader with a bewildering array of intrigues, plots and counter-plots. Be assured, however, that Steinhauer will not leave you dangling. Of course, it is understood by all readers that at the end of the novel Milo will be standing, even if battered, so that he can star in the next volume of the series. The series continues with: The Nearest Exit and An American Spy. I expect them to be exciting and well written as well. Faced with the potential dissolution of his marriage and the end of his quiet, settled life, reluctant spy Milo Weaver has no choice but to return to his old job as a “tourist” for the CIA. But before he can get back to the dirty work of espionage, he has to prove his worth to his new bosses. Following on the heels of these two spectacular novels comes An American Spy, Olen Steinhauer’s most stunning thriller yet. With only a handful of “tourists”—CIA-trained assassins—left, Weaver would like to move on and use this as an opportunity to regain a normal life, a life focused on his family. His former boss in the CIA, Alan Drummond, can’t let it go. When Alan uses one of Milo’s compromised aliases to travel to London and then disappears, calling all kinds of attention to his actions, Milo can’t help but go in search of him. The Milo Series may be setting a new standard for hard-hitting spy-adventure tales. I think so. Week 15-2012: The Tourist (Milo Series #1), Olen Steinhauer (2009). Retired software engineer who grew up in Montana, went to Montana State College in Bozeman, and moved to California to work at Stanford Research Institute (SRI). Carto's Library is about books I've read and liked; Carto's Logbook is about photography, travel and adventure. Mt. Maurice Times is tall tales mostly biographical. This entry was posted in Crime novel, eBook, Espionage and tagged CIA, Finnegan’s Wake, Milo Weaver, Olen Steinhauer, postaweek, The Sudan. Bookmark the permalink.